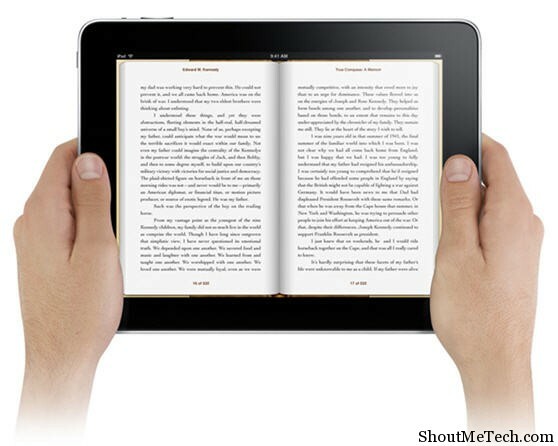 Ebooks are the next generation of books, also known as digital books. Instead of the regular hard cover books, these days people tend to lean more towards the lightweight digital books. These ebooks can be read on your mobile device, tablet, computers, laptops etc and can be carried around in a flash drive. There are many websites on the internet from where you can download free Ebooks and read them on your device. The advantages of an Ebook are plenty, but the most common one would be the fact that it’s digital and not heavy like regular books. A student always complains that he has to carry lot of books, but if ebooks were put to use instead of hard cover books, the student won’t have to carry any books as such. They don’t ever spoil and will last for generations of generations. You can carry your whole syllabus in a flash drive, which would easily fit in your pocket. They are compatible with all operating systems and are most commonly in PDF format, which is also supported by most smartphones and tablet PC’s. So, there are a lot of advantages, and big companies like Apple are actively trying to change the education system by pushing users to buy ebooks rather than textbooks. Here, we would be listing the top 10 websites to download free Ebooks from, as most websites also charge for downloading them. The Bookyards website has a decent collection of Ebooks that you can download for free. It also contains certain course material for schools and colleges along with other informative ebooks. 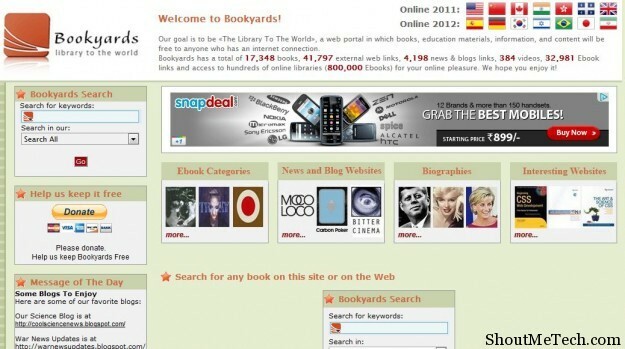 At the time of writing, the website had 17,348 free books. You can even upload your own ebooks or documents and share it with the world. Ebook Lobby is a great resource for downloading ebooks, there’s plenty to choose from. You can browser through the categories, authors etc and read them online or download them for reading it later. A top 10 list of the most downloaded ebooks is also shown, most of them about computers. OnlineFreeEbooks mostly consists of informative ebooks, instead of novels, stories etc. Thus, if you were looking to engage yourself in some learning time through ebooks, then this would be the best site to visit. If you want to learn more about photography for example, this is the perfect place to look. 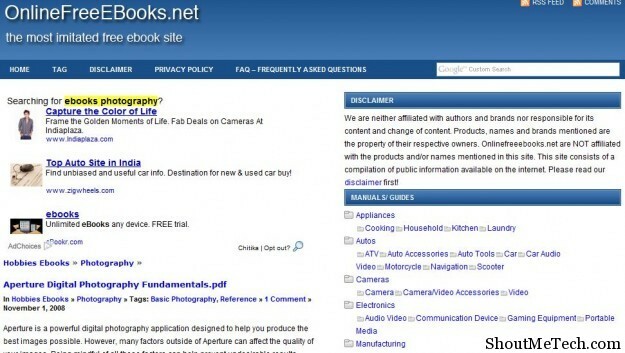 You’ll also find service and product manuals for cameras, laptops, mobile phones, other appliances, automobiles etc. E-Library has an extensive collection of ebooks, that you can either read online or download. The ebooks on the website are mostly about learning various aspects of life and how-to’s. There are paid ebooks that you can download too, but don’t expect to find any famous novel or story. Interested in learning and reading about technology? 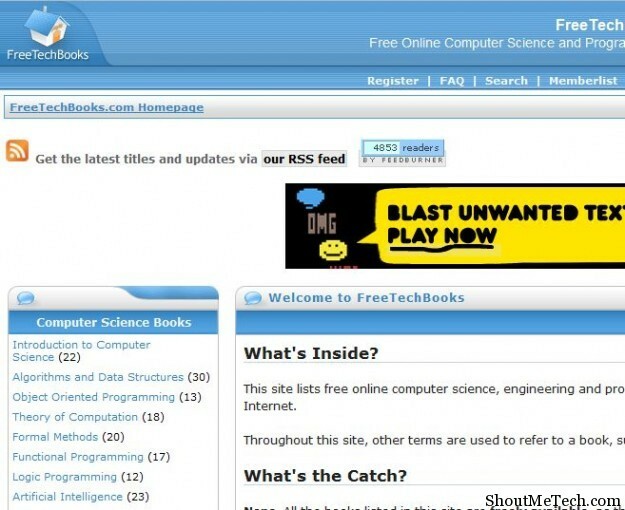 Free Tech Books offers a huge collection of technology related eBooks that are very technical and informative. You will also find lecture notes, textbooks and other course material on the website. This site offers free download of computer eBooks. A great website for anyone trying to learn computers, computer languages and more. Free Computer Books has a huge collection of computer related learning eBooks that can be downloaded for free. 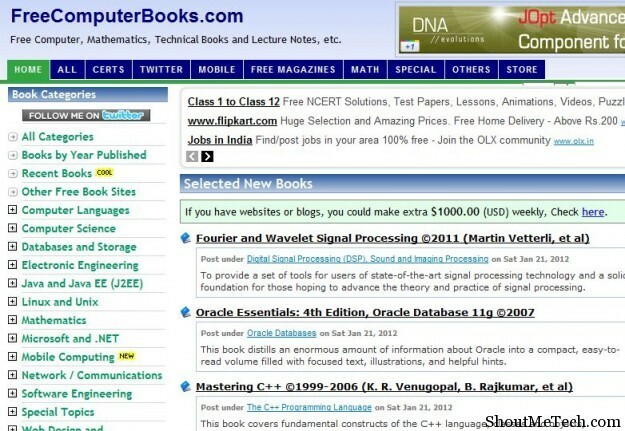 You can become a master at programming, designing etc by reading some of the books available here. Free Book Spot has educational material as well as fiction/non-fiction novels that will keep you coming back for more. There are lots of titles to choose from and all of them are free. I also came across some pretty interesting fiction novels. ManyBooks has a good collection of novels. 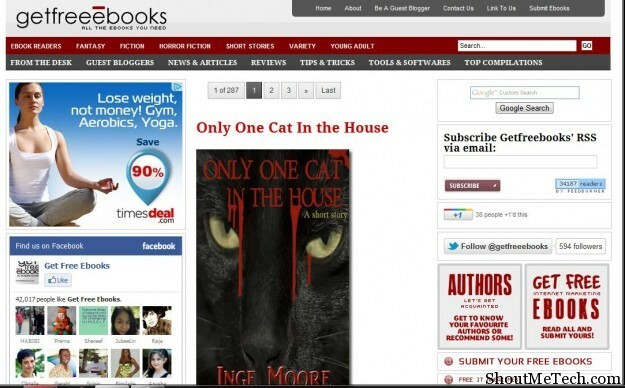 If you like reading fiction or non-fiction novels, then this is the website that you should be looking at. Although other websites have pretty good collection of novels too, they’re usually filled with other eBooks as well. This one is only novels! 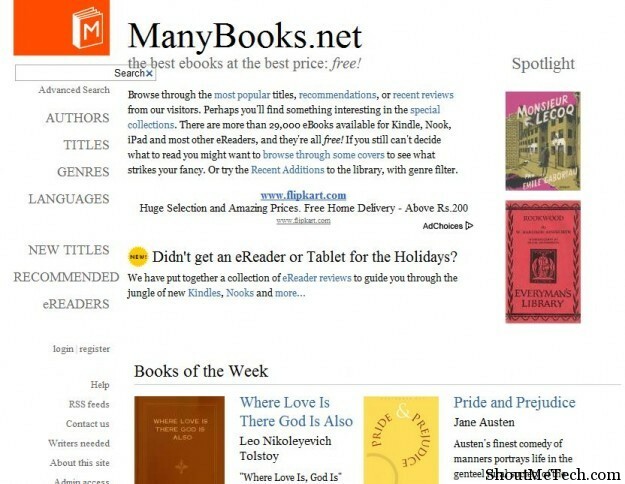 GetFreeEbooks has a nice collection of novels, books on literature and other interesting books. You can download all the ebooks for free and read them on your eBook reader as you can select which format to download it in. SmashWords doesn’t have a huge collection of free ebooks, but it has enough. 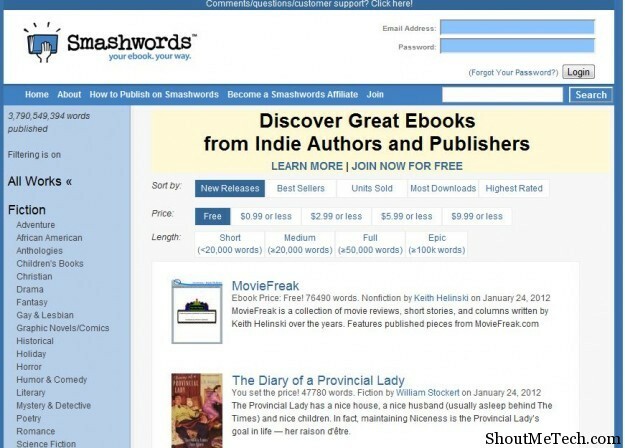 Although, if you were looking for paid ebooks from famous novelists and writers, then this is where you’ll find them. The collection of free ebooks is also pretty good and readers will surely enjoy them. You can even publish your own work here. Those are the best list that we could come with, as most of them offer some really good titles for free. 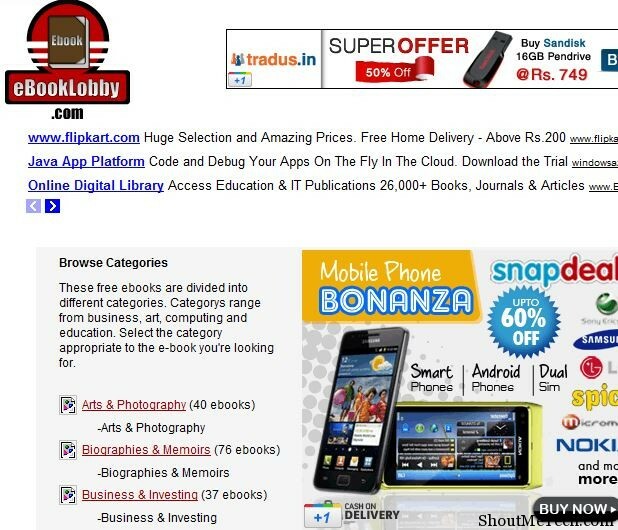 Using these websites, you can download free Ebooks and read them on your Ebook reader, tablet PC, mobile device etc. Good collection. I love to read books, especially ebooks on devices that helps me to get out of the boreness and these sites are pretty awesome. 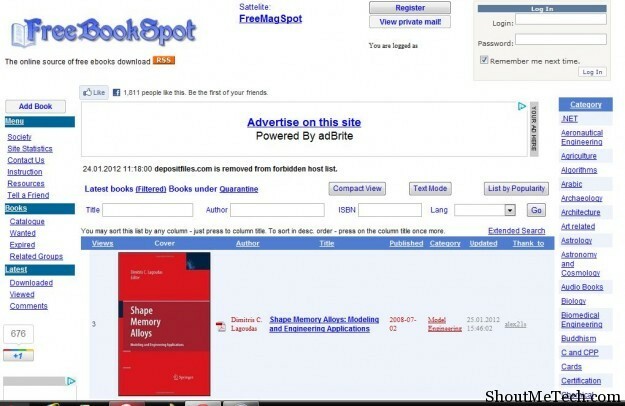 Thanks for sharing this free ebook downloadable sites, Keep updating.